Monahans Sandhills are part of a dune field that extends 200 miles to the West and North to New Mexico. This 3,840 acre park of sand dunes is a delight for children of all ages. Rent a sand disk or toboggan and surf down dunes up to 70 feet high as the West Texas wind swirls and lifts the sand into ever changing shapes . The day use area is well used with families picnicking, and surfing the hills. Clean restrooms are nearby. The Dunagan Visitor Center is where you rent your sand saucer ($1 per hour) and enjoy the hands on displays and the history of this West Texas desert area. A short (1/4 mile) self-guided nature trail winds through the dunes nearby. We spent a night camping here on our way home from the Big Bend area. The Willow Bend Camping Area (sites #1-14) offers pull-thru or back ins. 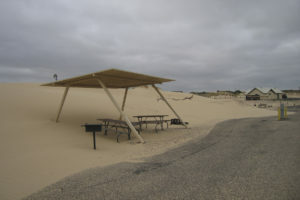 We stayed in site #5, a nice, level pull-thru with views of the sand dunes in all directions. This campground rarely fills up however if the back-ins sites were needed drifts of sand would need to be shoveled out of the way. The surreal feeling of being surrounded by all this white sand felt soothing and strangely enveloping. Sleeping with the blinds open heightened the effect. Tent or pop-up trailer sites (#15-25) are roomy and appointed with covered picnic tables and bbq grills. Most of the fire pits were buried under mounds of sand. Be aware that the wind blows and blows here. The fine sand will be everywhere and in everything. We observed a young couple breaking camp the morning we left, struggling a bit as their tent turned into a sail in the wind, their children occupied with digging and playing in the sand. Surprisingly a dependable source of pure, fresh water is found right under the sand. This drew prehistoric man to hunt bison and mammoth in the area and later Indians, mostly Apache and Comanche camped here. No one knows for sure why this massive field of dunes is here. One theory is of erosion and wind blowing the sand into this area over the course of millions of years. There are equestrian camp sites here and 600 acres of sand set aside for riding. Overnite or 3-day Texas Camel Treks are held here in the Spring. Take exit #86, just west of Odessa as you travel Interstate 20 and spend the day or overnite at this fun park. Note: train tracks run directly outside the park and trains may occasionally be heard as they pass by. This entry was posted in State Parks and tagged camping, equestrian camping, Monahans Sandhills State Park, sand disk, sand dunes, tent camping, Texas camel treks, West Texas. Bookmark the permalink.